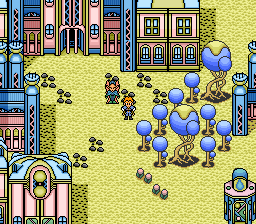 Time now to dive into the surreal (and very pastel) world of Lennus, a much maligned and in my opinion, misunderstood RPG for the SNES. Published by Enix in the US inexplicably as 'Paladin's Quest’ (there are no mention of Paladins at any point in the game), Asmik's Lennus is at first glance your bog standard Dragon Quest and Phantasy Star imitation. However, as is sometimes the case, if you delve a little deeper and look past the obvious flaws, you'll find a sweet little game just waiting to be loved. Anybody who has read my homage to Super Play will know that when I was a youngster, I generally only bought games that received favourable reviews in the magazine. However, there was something about Lennus that that interested me from the first time I saw it way back in 1994, and even though it received just a meagre 62% in it's review, it charmed it's way into my head, and there it stayed for almost 17 years. This year I finally got round to giving Lennus a long awaited play through...at this point I should clarify that I'm going to carry on calling the game by it's original title, not the meaningless name of 'Paladin's Quest' that Enix fobbed it off with. To this day, I still find it strange that Enix decided to bring Lennus to America as one of it's first SNES titles. I can see why they were drawn to the game, because it is possibly the closest thing the SNES had to Sega's Phantasy Star, but given the relative lack of interest in RPGs at the time in the west and the game's decidedly strange 8bit graphics, it seems like an ill conceived decision, and ultimately was. Lennus was pretty much dismissed out of hand by magazines and gamers alike, the result of this complete lack of interest from the American press and public, extinguished any slim hopes the game had of making it to shores of Blighty (just for a change). And that’s something of a shame because Lennus is a curiously unique little thing that actually has a lot going for it. The story, though in no way revolutionary is full of quality touches and despite being held back by the translation from Japanese to English, it certainly has a unique style that can get very dark at times. There are overtures of love, loss, insanity and more than a smattering of racial prejudice and contempt...and of course, there's the maniacal dictator trying to take over the world (obviously). Large portions of the plot are left open to interpretation, although I suspect this may have been unintentional. The plot centres around 13 year old Chezni; the game's main protagonist (thankfully you can change his name) who is a student at the famous Magic School of Naskuot, and who also happens to be unusually adept at controlling Spirits (casting magic). After caving into some peer pressure at the school, Chezni enters the forbidden Tower of Ganbid and subsequently activates Dal Gren; an ancient machine with awesome destructive capabilities...in true RPG style, the tower was neither locked nor guarded! This results in mass chaos for most of the world, and forces Chezni to set out on a mission to correct this (pretty almighty) gaffe. Along the way he meets Midia, a young girl who has an unspoken bond with our hero, and together they must discover their lineage of the heroes of lore; Kormu and Sophie and rescue the world from impending darkness. The world of Lennus is made up of a vast ocean and a land mass that is split into two continents by a large equatorial river. The story begins on the northern continent of Naskuot, which is your (almost) typical fertile and hospitable RPG country, complete with beautiful (albeit blue) forests, fields and mountains. As well as being home to the grand Magic School, Naskout also boasts the resplendent city of Juryan and the Skuruu camp (literally a village in the sky). Saskuot on the other hand is (predictably) a harsh and barren land, full of jagged mountains and snow covered tundra. It is also under the rule of the megalomaniac Zaygos, who's seems intent either on ruling or destroying the world, naturally this has made it's inhabitants pretty hostile toward anyone from the north. The two continents are linked (as are some of the major towns) by the sprawling Rope Network System. This is a neat way to get about the world of Lennus, and is basically a large cable car that connects the (very) spaced out populace of both continents. It can be somewhat of a godsend when you're fed up of walking long distances with nothing but innumerable random battles for company. Visually Lennus really is out there on it's own. At first glance, it looks a bit like a NES game on steroids, but when you step out into the world, you get a taste of what the designers were going for. Apparently the graphics are inspired by a famous Japanese artist, I've no idea how accurately they represent his style but I like them a lot. Everything looks very alien and otherworldly, right down to the mountains and trees, and even the buildings seem organic somehow...as if they were grown rather than built. What stands out most to me though is the near total absence of primary colours. Just about everything in the game has a pastel colour to it, there are liberal uses of cyan, pink and purple and this just adds to that bizarre feel. The inhabitants in the world of Lennus also benefit from this crazy graphical direction, and there are a myriad of bizarre species to interact with, each with it's own colourful and unique make up . This appearance really appeals to me and even though the visuals do look a tad basic, you can tell that the developers at least tried to do something different, and shy away from the usual rolling green hills and grey castles found in most other RPGs of the period. Lennus genuinely does look unlike anything I've ever seen on the SNES. For me, music is where Lennus excels most and is what really makes it stand out from it's contemporaries. This is no doubt thanks celebrated composer Kōhei Tanaka (of Patlabor, Gunbuster and Alundra fame) who created a soundtrack that has real class to it. While you do have to put up with some of the obligatory RPG fodder, most of the tracks (although short) are atmospheric and convey a wide range of emotion. It's best offerings are easily amongst the best I've heard on the SNES (high praise indeed), with the soothing town theme and the hauntingly beautiful Godom Lullaby being the pick of the bunch. Gameplay in Lennus will be instantly familiar to anyone who's ever played a console RPG, but there are some quite intriguing twists to help set it apart from it's then rivals; titles such as Magic Knight Rayearth (in Japan) and Mystic Quest (in the US). Whilst wandering the world map or a dungeon, enemies are encountered at random; the battles are fought in the traditional turn based manner and viewed in the first person (ala Dragon Quest). The system itself does take some getting used to, the commands are laid out in such a way that each button (or direction on the d-pad) corresponds to an action, and it can be operated using one hand (perfect for the lazier gamer!). I read many complaints about how this system is cumbersome and hard to navigate, but to be honest I found it quite intuitive and refreshing. Either way, after a short while (unless you're retarded) you’ll find yourself flying through it with relative ease. For the majority of the game you will only have two permanent members in your party out of four available slots, the remaining slots can be if you so choose, filled by mercenaries. These characters can be hired from almost every town in the game (usually in the local taverns), the majority will demand hard cash for use of their services, but there are a few that will ask to join your party for more personal reasons (revenge, repaying a debt etc). The mercs, while controllable, come pre-equipped with spells and weapons etc, that cannot be altered, this therefore adds an extra dimension to the way you play through the game. Do you take a chance and spend the money to hire help, or struggle through with Chezni and Midia and gain more experience in the long run? Another oddity which really adds to your tactical planning in battle is a total lack of magic points (MP) within the game. Whenever a character casts a spell, they do so by using their own life force, therefore reducing their hit points (HP). This also means there is no generic healing magic to call upon (although there is one spell to heal the entire party...at the cost of the caster's life). Healing is achieved through the use of bottles which can be found throughout the quest and filled up (with a healing potion of sorts) in shops throughout the land. Though bottles vary in size, getting larger as the game wares on, they are only good for 9 uses each, it sounds pretty basic, but it makes you think twice about steaming into a new area without first checking things out and getting prepared. Perhaps predictably, magic is not learned in the traditional manner. The characters gain Spirits (a bit like Secret of Mana) and by combining two of the eight available, the player can cast a variety of spells. There is no leveling up the spells as such, instead the character gains more of an affinity with a certain Spirit the more it is used. It is worth baring in mind that Lennus is one of those RPGs in the traditional Japanese style...there are parts where levelling up relentlessly is essential in order to progress through some sections. While I don't mind this, I can understand how for some, it's like having teeth pulled out. Despite all the things Lennus does well, there is no disguising the fact that this game has some biblical flaws, and in the cold light of day, it isn’t hard to see why the general reception in the west was so poor. For it's American début Lennus was given to Enix for translation, and unfortunately (and unusually for Enix) it seems that the translators either really disliked the game or had all been replaced by brain damaged apes, because the translation is nothing short of abysmal. It appears to me, (but I could be wrong) the English characters used in the translation were too wide for the original text boxes and, as a result anything classed as a name gets restricted to just six characters! Rather than correcting this within the game's code, it seems Enix just decided to abbreviate…everything. This is actually worse than it sounds because it has a catastrophic effect on not only the story but also (more crucially) items and spells, which are a massive part of this game. The result is that the names of the majority of spells and items are completely unfathomable unless you refer to a walk through or go with trial and error. I found this to be an unbelievable ball ache, and I was playing on an emulator with save states…so I can only imagine how much rage this would have caused back in the day when you got killed in battle because you ended up casting twelve incorrect spells. As mentioned, whoever translated Lennus seemed to do their best to ruin it and it definitely shows in some of the game's dialogue. It often sounds like conversations are deliberately rushed or drastically shortened. Other than being generally annoying, the worst part of this awful "localisation" effort is that it butchers the story...you can almost see a brilliant little tale trying to force it's way out from behind the mediocre and sluggish sentences. I know RPG's were (and probably still are to an extent) a niche genre back then but that's no excuse from a company who's 'bread and butter' was in RPG gaming. My other big complaint concerns the character development (or lack thereof). Other than Chezni, Midia and Zaygos there isn't really anyone else in the game who gets a decent amount of back story and padding out. For me, they missed a trick here because it would not only have expanded on the game's potentially decent plot but also added a few hours extra to the play through time (which is less than stellar). RPGs are about stories and their characters, a chance to get closer to some of the game's more interesting denizens would only have been a positive in my book. Having said all that, I feel a genuine affection for Lennus; it's an honest little game that tried hard to break away from the generic RPG formula, but retain that familiar feel. It leaves you with a warm glow inside when you play it and a tinge of sadness when you finish it...a sure sign of a good game in my book. And the fact that is a good game, in my opinion makes it even more of a shame that it got sold short, if Enix had only bothered to spend more than half a day on the translation, then it would have easily enjoyed success Stateside and possibly (eventually) made it’s way over here. It would never have troubled the RPG cognoscenti, but it was more than capable of rubbing shoulders with the likes of Lufia and Mystic Quest...and that would have been more than welcome here in the UK. Probably the biggest tragedy borne out of Lennus’ failure though is that if the game had made an impact on its release stateside, then we may well have seen it's awesome sequel (imaginatively titled Lennus II) released in an official capacity in the west too. Luckily, there is a solution on this front though; Lennus II is available to play in English thanks those ROM hacking heroes over at Dynamic Designs. I for one still hold a faint hope that one day; they will step in and give the original game the proper translation it has always deserved. Although Asmik were never renowned for wowing the world with their SNES offerings, in Lennus they really did produce a little gem. Sure, it’s rough around the edges and the visuals don’t do much to push the system, but I think it has more than enough in it’s locker to stand out in the vast crowd of SNES RPGs. Anyone who considers themselves a pointy hat fan or has a soft spot for the traditional console RPG really should give it a whirl. It will never reach the bar set by the Chrono Triggers of this world, but it will provide a good 20 odd hours of solid gaming enjoyment. Can't really argue with that can you? Hey, I know this is a really old post, but great post about a rare gem of a game! I just wrote a long blog post about it as well, focusing on the world that the game creates (at gamemakeworld.wordpress.com). Thought you might enjoy it! Wow, thanks for the comment...it's not often you find another Lennus fan! Just had a look at your blog, and it's excellent, fantastic screens and so well written. I'll definitely be following it, are you on Twitter by chance? It'd be ace to have some RPG related conversations. I remember this game fondly. I was already a fan of rpgs from the SaGa series in gameboy, and when I saw this game I immediately went for it. I's one of the best of the snes first wave of rpgs. It had a very engaging story and playability. Its sequel was not bad but, I don't know why, I didn't like it as much as Lennus I.